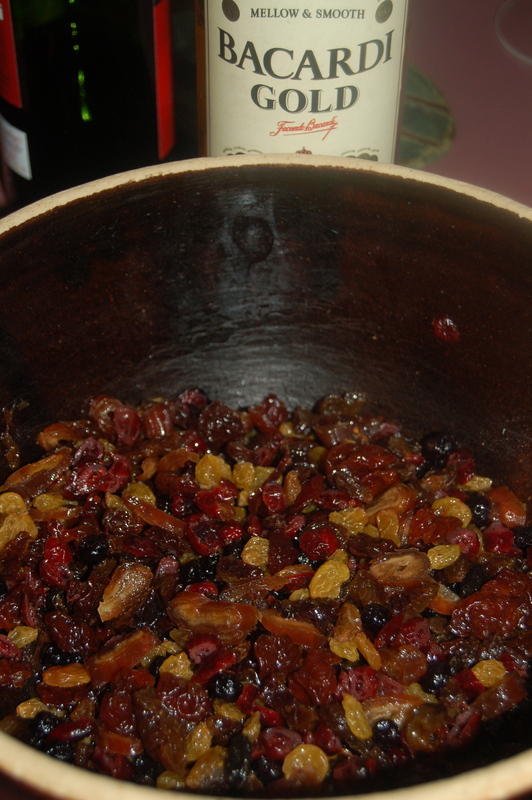 dried cherries | Crappy Kitchen - Good Dinners! We arrived in the afternoon and after dropping in to my brother’s work place to say “ciao” we headed to the house armed with the ingredients for dinner. I put a bottle of prosecco in the fridge to chill and then off we went to catch frogs. 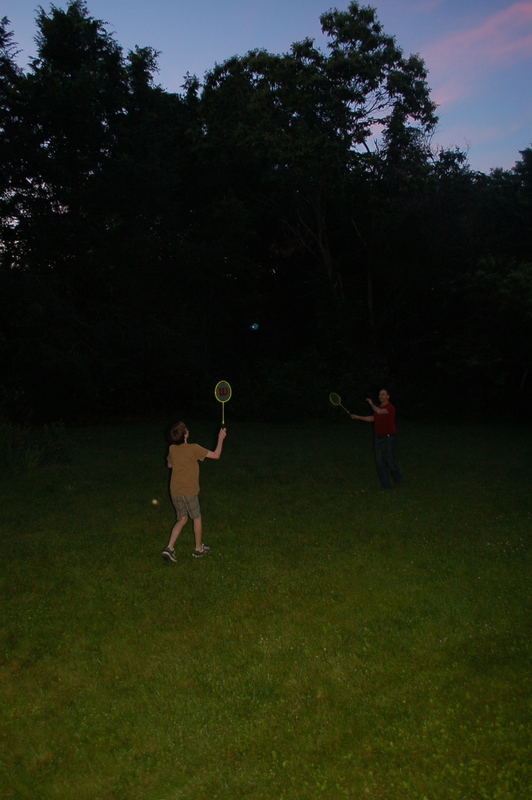 Anyone for late night badminton? By the time Pascal arrived home, dinner preparations were in full swing, a movie underway and the bottle of prosecco half drained. I love nothing better than a loud kitchen with lots of happy people milling about amidst the wafting aroma of food. It has the magical effect of making you think everything is alright with the world, and if creating that illusion is a simply matter of preparing dinner I’m all for making the effort every evening that I can. 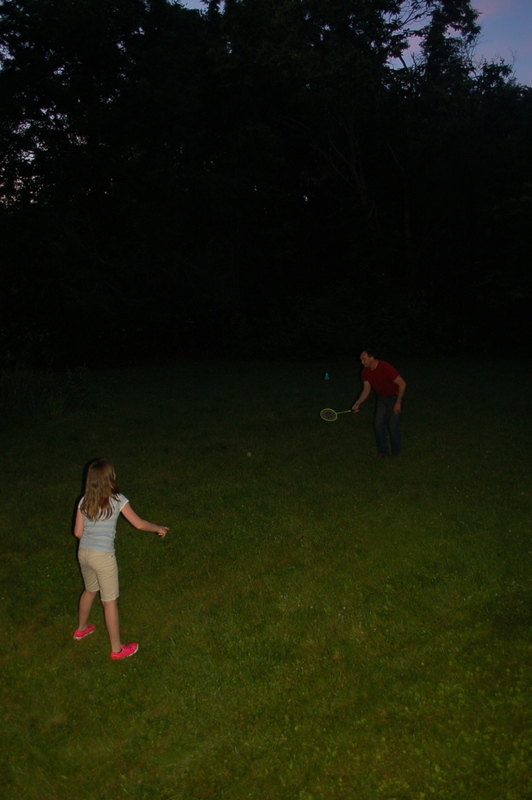 We ended the day with a riveting game of badminton, and although playing in flip-flops is not recommended, don’t let it stop you for a second! 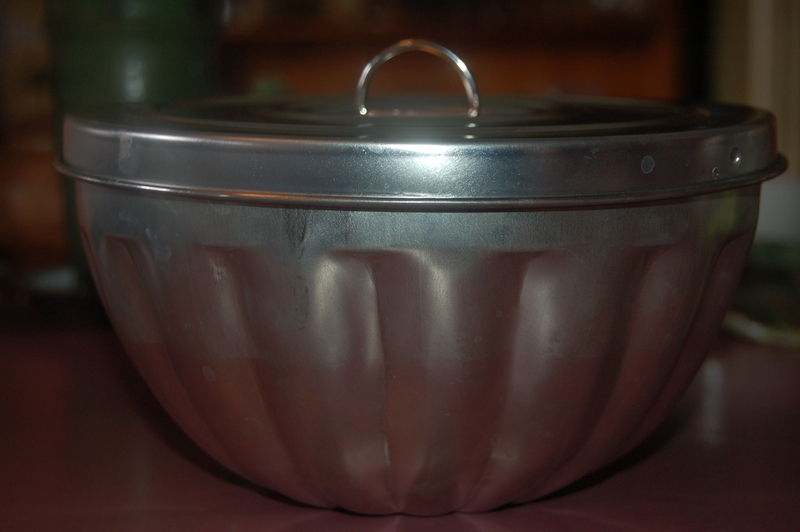 1 – Place big all-purpose pan (with lid) on medium/high heat and add the oil. When it is hot, sear the chicken in batches until surface is golden brown. Transfer to a plate as you go. 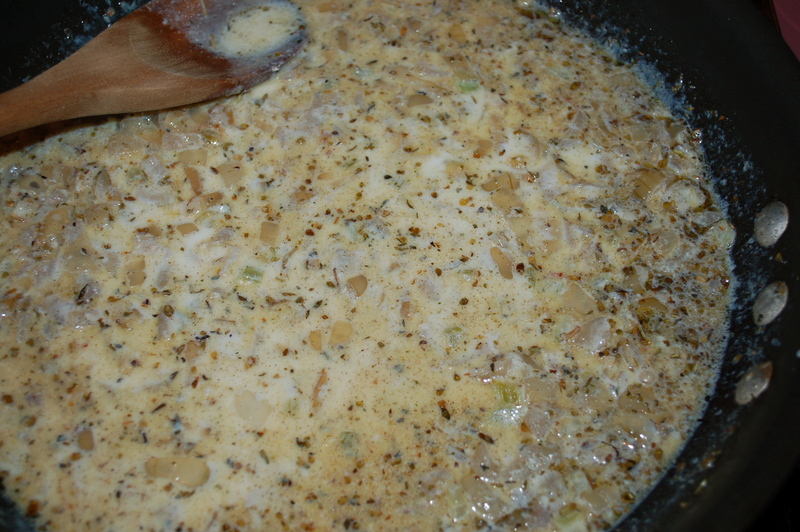 2 – Turn heat down to medium/low and add the garlic, onion and celery. Saute for about 5 or so minutes, stirring occasionally. 3 – Add the mushrooms, cherries, and herbs and continue to cook for another 5 minutes. 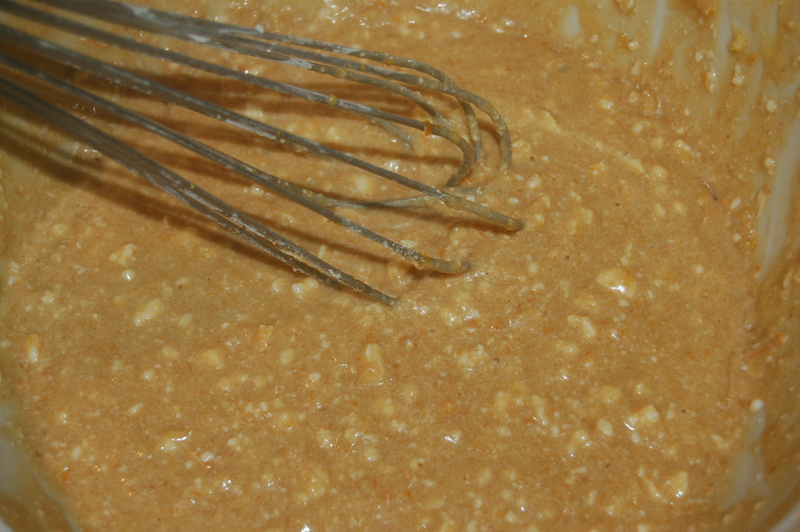 4 – Add the curry powder (and bouillon cube if using), and stir for a minute, then add the flour and mix well. 5 – Add 1 cup of broth/water and stir well. Continue to add water/broth and turn heat to high. When mixture comes to a bubble, add the chicken in an even layer. Turn heat down to low (a simmer) and cover. 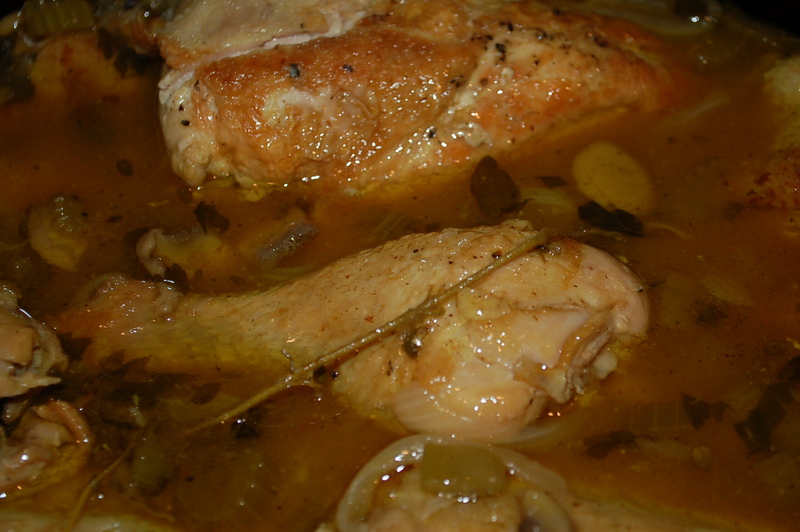 Simmer gently for 1 hour.Turn off heat and let everything rest for about 10 minutes before serving. Serve alone, or with a pasta, rice or crusty bread. I served our dinner with tagliatelle (egg noodles) and it was really tasty. There are foods that remind us of our childhood, foods that when tasted, make you feel instantly like a little girl or boy again. As I write this I am reminded of the scene from the animated film Ratatouille ( you have to see this, or, if you have, you need to see it again!). So, he is presented with the rustic dish, Ratatouille, and is surprised that the restaurant owner would try to impress him with such a lowly entrée, that is, until he tastes it. Hmmmm, when it hits his mouth, he is immediately transported to his grandmother’s house, and he is a seven-year old boy again, and life is good, and he is happy. He becomes sublimely happy, sublimely. I think of my childhood whenever I attempt to make my mother’s christmas stuffing. She threw it together in a blue basin in our kitchen with such deftness, one would have presumed it was a hum-drum affair. Not so, it was special. I have never been able to reproduce it, and it is because of this I know that each cook has his or her own special gift, something that comes to them because of how they lived their lives. She had a touch only she possessed, and I can never capture that taste, no matter how I try. 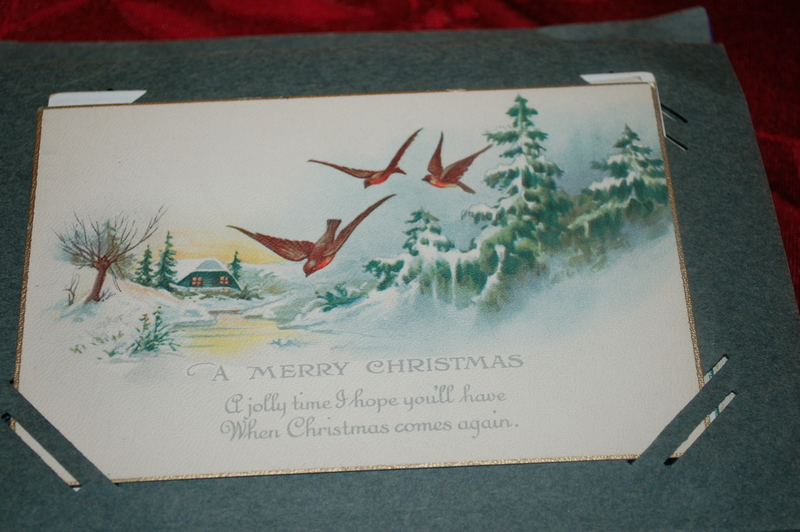 This Christmas I decided to work with her to make something that involved both of our personalities and experiences. Sadly, she is not here to guide me, but I felt her, every step of the way. 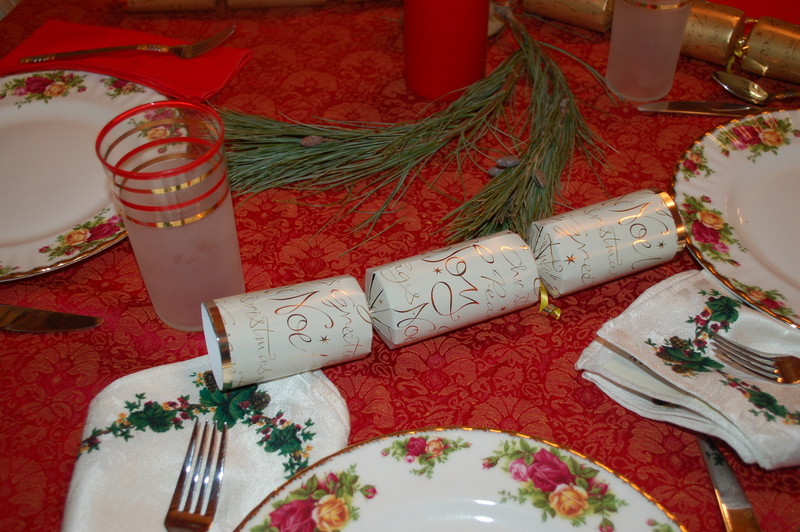 I made her bread stuffing so that my Christmas table would feel familiar to me. I added new ingredients of my own to make something new, something that she would like and approve of, but something that still retained the essence of her recipe. It was a lovely collaboration, and my kitchen smelled of both of us, the old and the new. I can see my children puzzling over this recipe in years to come, and perhaps deciding to also add something of themselves to it, something to hand down to their children. I think that would be nice. You will need: 6 cups bread crumbs, 2 medium potatoes, 3 tbs unsalted butter, t tbs extra-virgin olive oil, 2 cups milk, 1 cup chicken broth, 1 rib celery, small dice, 1 onion, finely diced, 1 tsp ground allspice, 1 tsp oregano, 1 tsp Herbes de Provence (this is a mixture of dried thyme, marjoram, rosemary, basil, lavender, & fennel. It can be found in the spice section of most supermarkets), 1/3 cup dried cherries, 1/2 lb bacon, cut into smaller pieces, 1 tsp sea-salt, freshly cracked black pepper. 1 – Peel and boil the potatoes until soft. 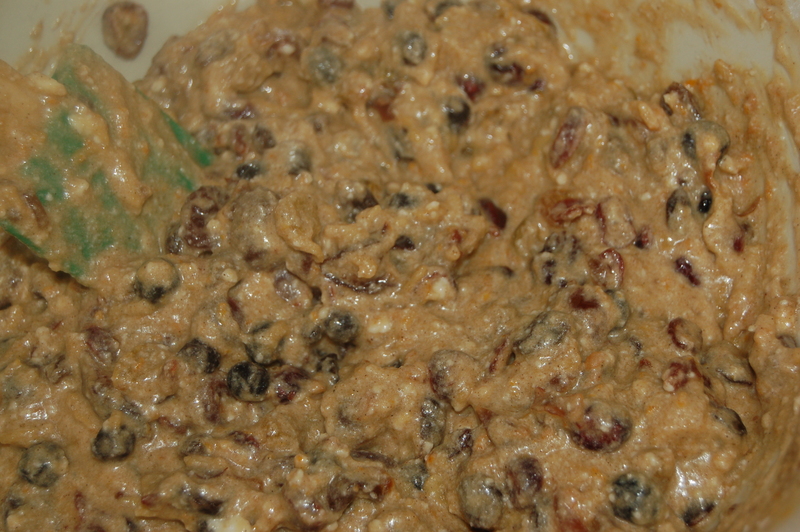 Drain the water and mash with 1 tbs butter, 1/2 cup milk, 1/2 tsp sea-salt, several grinds of black pepper. Set aside. 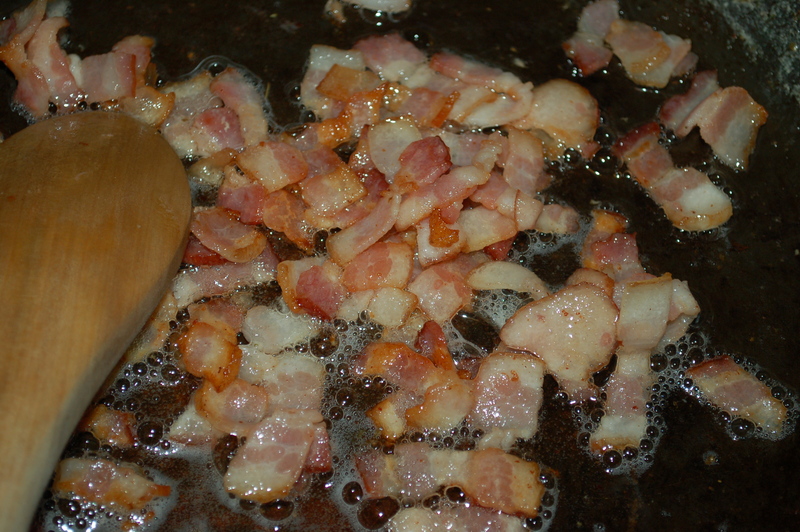 2 – Fry bacon and set aside. 3 – Put saute pan on medium heat and add 1 tbs butter, and 1 tbs olive oil. Add onions and celery and cook for about 15 minutes, until very soft. Add another tbs of butter, the rest of the milk (1 1/2 cups), chicken broth, herbs and spices, and heat until everything is warm. 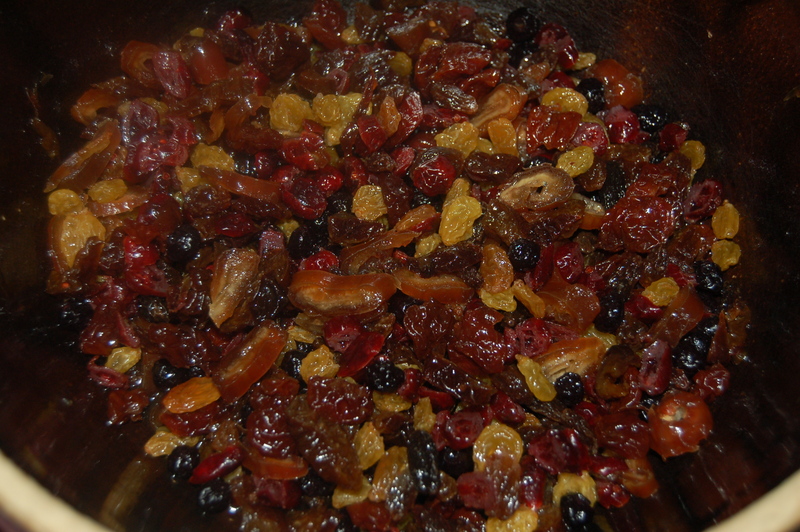 Add cherries and turn off heat. Set aside. 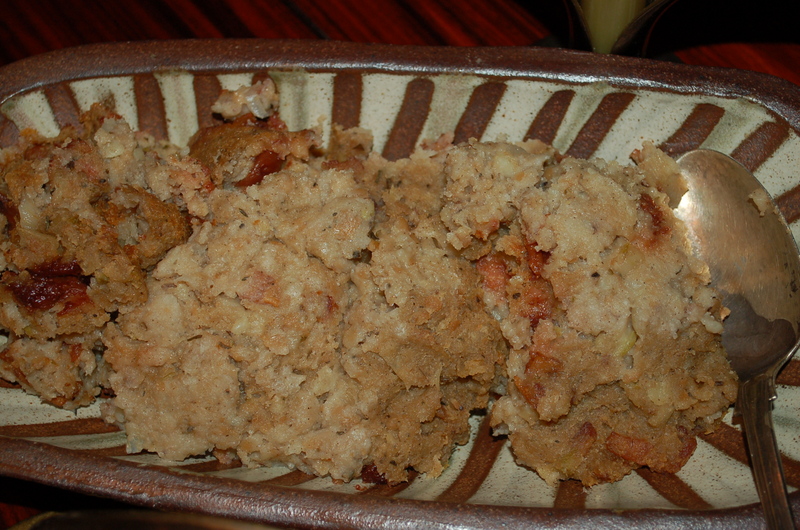 4 – Put breadcrumbs into big bowl and add the cooked potatoes, bacon, and milk mixture. stir it all together (or use your hand, like I did). It should come together into a loose ball. If it is very sticky, add more bread crumbs until you are happy with the consistency. Taste for addition of salt and pepper. 5 – Butter an over proof casserole or pan and add the stuffing. 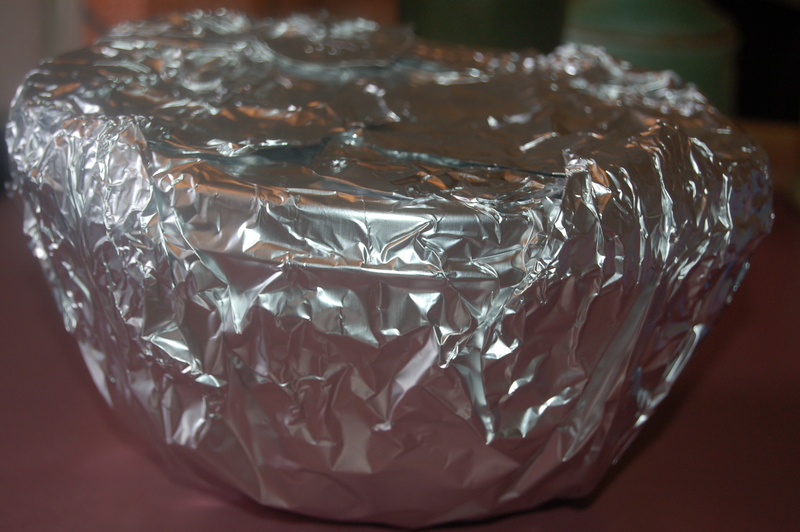 Cover with foil, and bake in oven for 30 minutes. 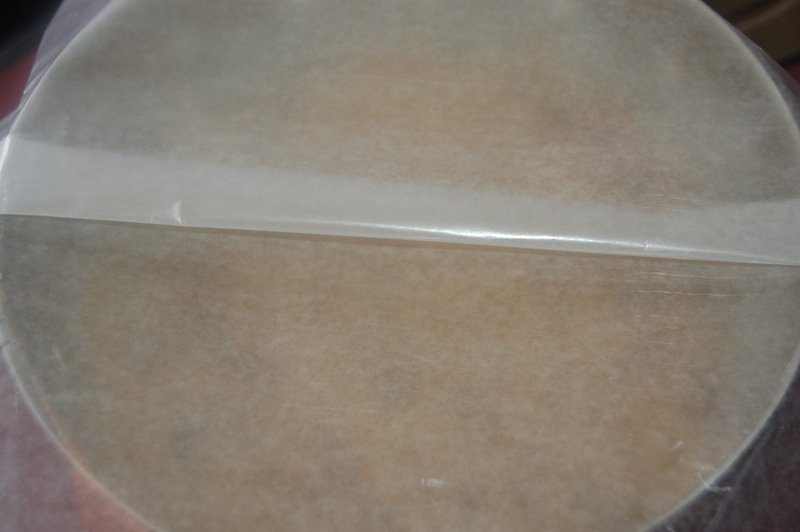 Take out and cool before cutting into triangles or squares. You can also do what I did, and turn the cooked stuffing into a nice dish and set on the table for everyone to help themselves. If you ever panic about having to make salad in a hurry, I am about to rescue you! 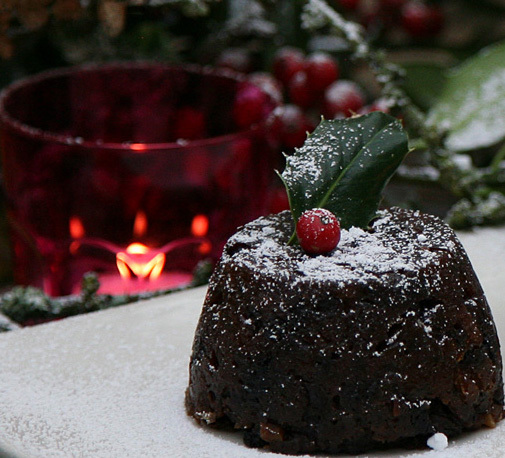 This is easy, goes with every main dish imaginable, and will look perfectly festive on your dinner table. I cheated and bought the greens already mixed, washed and dried. This saved me tons of time, making it possible to put together a salad last minute! 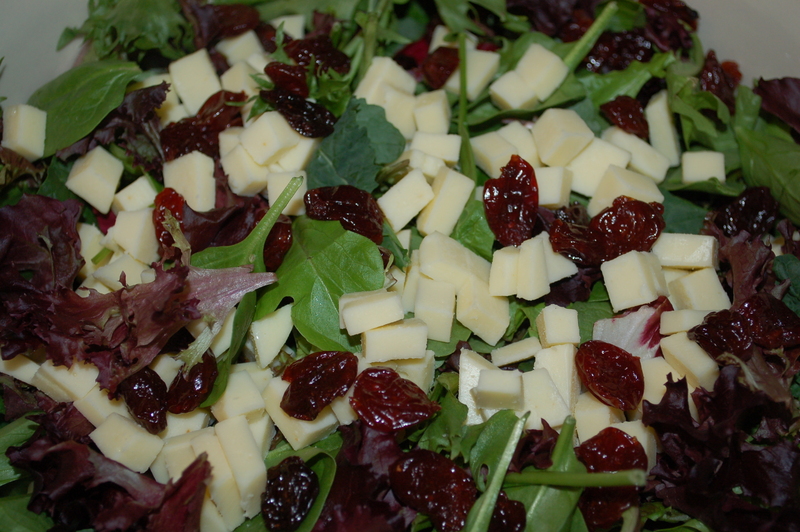 1 – Put washed and dried salad greens into a bowl and top with cheese, cherries and apples. 2 – Mix oil, balsamic, honey, salt, and pepper together. Taste, and add more balsamic, salt or pepper according to your taste. Dress salad and toss just before serving.